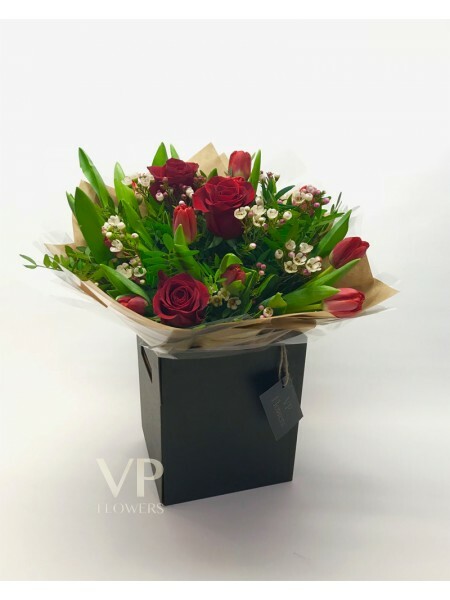 Treat the special someone this spring in your life with fresh 'Rose and Tulip' bouquet from VP Flowers created by our top florists. If a small flower or foliage pictured here is unavailable for any reason, we will substitute this for one of the same or higher monetary value and in a similar style and colour. Please note: with all natural products there may be slight variances in colour. If you have specific requirements for your bouquet, please call us to let us know. When you receive your flowers, we recommend you remove the bouquet from the packaging, cut the stems and place them in fresh water in a cool room away from direct sunlight and drafts.